Have you ever thought about how your feet affect your posture? I never have until I learned FOUNDATION TRAINING. I do remember the first thing we learned was about how to position the feet and what is going on with the femoral bone. We did not go into great depth about this other than it was important to have the feet positioned correctly. After a year of teaching FT and learning more and more about the body… The feet are a huge part of posture and a reason a lot of us have hip/ pelvic/ back issues. I remember as a kid my mother always telling me to stop pointing my right foot out. I just remember thinking that’s how it was made. Little did I know maybe this foot position was the beginning of my future back problems. Take a look at the pictures. If your feet look like this get an assessment. 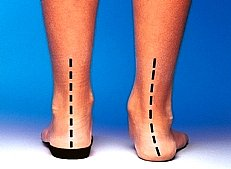 It just makes sense if the feet are in a poor position it will affect the Ankles/ legs/ hips into the pelvis and back. Always remember everything is connected. In the picture you can see how the position of the foot affects how the hip/pelvis work. To simplify…if it doesn’t line up well there is going to be a kink. Over time this will cause imbalances, wear and tear on a joint and pain issues. My right foot to this very day still wants to point to the outside. 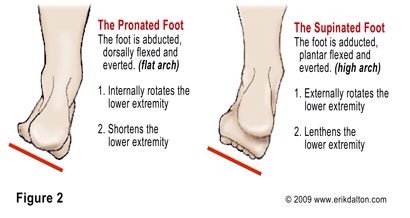 Since I am aware of this and have more body knowledge I really work at keeping that foot pointing straig ahead. Foundation Training really helped me with that. Also, I really make sure my right foot is in correct position when working out. Take a look at your feet…get an assessment…learn Foundation Training!